We Were Liars absolutely and completely blew me away. From the moment I opened the book, to the moment I closed it and stared at its cover in awe, We Were Liars was brilliant. Incredible. Mind blowing. Moving. Beautiful. I cannot use enough adjectives to accurately describe how much I adored and loved and covet this book. We Were Liars centres around Cadence Sinclair. A spoiled, broken rich girl. Cadence’s internal monologue throughout the entire novel was captivating. It truly was. It was rife with beautiful metaphors and made-up fairytales and painful memories. And every single word made me want to keep reading. Her love for Gat was gorgeous. Gat himself was gorgeous. This ship sailed from the shores the instant I was introduced to it. It was completely bittersweet and incomprehensible and yet understandable – all at the same time. And I think that’s one of the things that drew me to it so much. Its depths and intricacies. I could read on and on and on, which is pretty much what I did until I hit the last word of the last page. I loved the pacing. The pacing was beautiful. It let me know exactly who each character was, and exactly what had happened before the accident which Cadence does not remember. The mystery was drawn out and suspenseful, but did not annoy me in the slightest. Of course, it made me want to keep reading, but every single other aspect of We Were Liars made me want to keep reading, as well. This was mystery done perfectly, I tell you. Absolutely perfectly. I’m not going to lie about the ending, but I will tell you that after I finished it, I practically went back and re-read the whole book. I really needed to. I needed to go back and read what the characters really meant when they said things I couldn’t understand, or that I couldn’t decipher. And it made so much sense. It made such sense. Now, I'm not entirely sure if what I am about to say next is spoilery, but it's about my emotions (but sometimes a reaction can spoil, which is why I have made the text white). We Were Liars made me cry. It made me sob and it made my throat constrict with the effort of trying not to bawl at midnight. And it is now the sixth book in my entire life to ever make me cry. It is that beautiful. It is that heartbreaking. It is that superb. I cannot get over We Were Liars. I cannot get over everything that it gave me, everything that it made me feel. And I have a deep sense that I will never get over it. 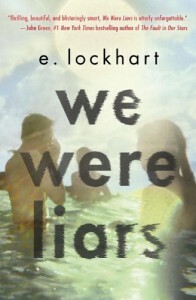 Because We Were Liars is not a book that you can ever forget.